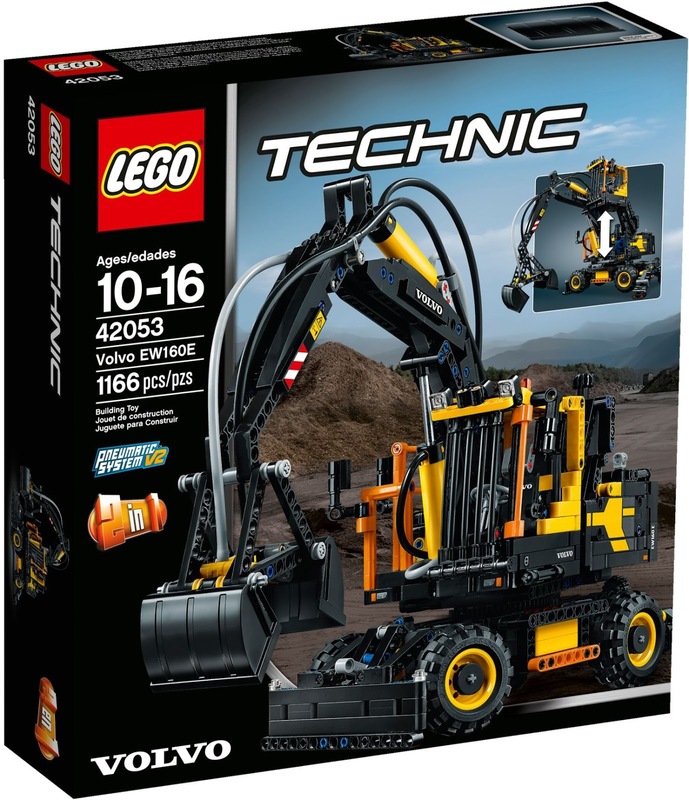 We're back in the comfortable and oddly exciting realm of LEGO today, with yet another dalliance with what is quickly becoming our favourite section of the toy company's range: Technic. A nice meaty set, we've spent the the last couple of days (we must be out of practice) assembling one of the new sets... and it's a good 'un. 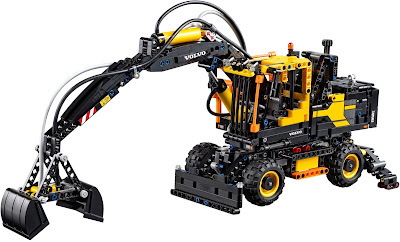 We review the LEGO Technic Volvo EW160E. The what? The Volvo EW160E is a wheeled excavator in real life; a new release for the construction industry by Volvo. LEGO have recreated it with 1166 parts, making it comparable in size with the much larger 24 Hours Race Car set from last year. However, whereas that car model was large and used a lot of covering plates, the LEGO Technic Volvo EW160E is extremely dense and compact, as well as being far more intricate and delicate to complete. Oh, and it uses a pneumatic system. Eek! The finished model is a sight to behold, and looks more realistic and convincing than any other Technic set we've built. There is a lot going on here, with many moving and adjustable features. But as a thing to simply sit on your desk or shelf, it's great. As you can see, the whole upper section rotates on the wheeled base. It is the only action (other than pushing it about on the wheels) that doesn't have a mechanism or cog. However, it is very smooth and seems very well balanced. When you're ready to do some digging, stabilisers can drop down at either end of the vehicle; two feet with locks at the rear, and a large scoop up front. These hoist the whole model a few millimetres off the ground, making it very stable. Unfortunately they don't employ any locking systems to keep them up and out of the way, and occasionally we've noticed that the front one in particular tends to droop down. ...that control cabin itself is awesome. There is a branded Volvo seat (with headrest and adjustable armrests), a steering wheel, and also a mirror (well, a sticker of a mirror). LEGO have also seen fit to include the orange high-vis hand rail at the side. Next up, the pneumatics. There exists three switches at the back - two to control the boom arm, and one for the bucket claw. You can either give the vertical pump (the large black button to the right of frame above) a few pumps, then operate your switch of choice, or instead knock the switch one way or the other and then use the pump to push the arm or the claw open or closed.The second option usually yields better results, as you get a bit more control. ...the rear plate flips open to reveal all the rubber tubes. The tubes! The tubes! Argh! Those tubes extend to the very end of the boom, were you'll even find a small air piston (about a third of the size of the two used in the arm itself) which powers the claw. Check out the small detailed stickers as well. ...you can use the dial on the back to operate the steering. The whole thing rolls easily, and the turning circle isn't bad at all. There are some nice details on this thing that you might not realise you've built until you're finished. Above is more of the high-vis orange, this time for a handrail about the right side, and notice two more mirrors, intended to let the driver see all the way around the vehicle. The LEGO Technic Volvo EW160E is not minifig scale, but stick a few on there anyway. Why not? The use of stickers is also very good, with the above being the largest in the set. Nothing looks all that much like filler detailing, and we assume that all that design detail is just what is on the real digger. There are also some highly-detailed ones like this tiny Volvo logo; again, we assume the real thing has a logo there, so makes sense, eh? The LEGO Technic Volvo EW160E was not an easy thing to throw together. With very few large plates, most of the set is small pins and parts, so the 'teenage' rating LEGO has given it (10 to 16) is spot on. That said, there is something about this model that is absolutely perfect. The finished product looks great, and the build was very involved and slow, so you feel like you've really put some effort into making this. For the size, price, and finished play features, this is the perfect example of what LEGO Technic should be.